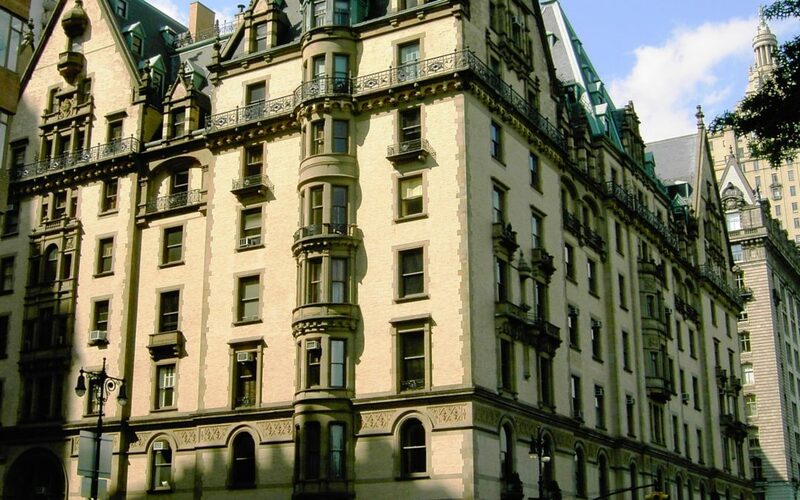 When the Dakota Building was constructed in the 1800s in Manhattan, it stood on its own in an isolated position. Now it is surrounded by high rise buildings. Today it’s a place of pilgrimage for John Lennon fans as it’s the place where he lived in his latter years and where he was murdered in 1980. It was purpose-built as a cooperative of apartments and in its history has housed many celebrities such as Lauren Bacall, Judy Garland and Boris Karloff. For every famous person who has lived there, others have been rejected by the board including Carly Simon, Billy Joel and Gene Simmons. As you can see the building was very well known before it became known throughout the world as the place where John Lennon was shot – this took place outside the south entrance to the extravagant apartment block. But to me there’s an equally creepy reason for visiting the Dakota. The building was used for the iconic 1960s horror film, Rosemary’s Baby. The film was based on the book by Ira Levin. The author had lived in buildings similar to the Dakota and it was this that helped to inspire him to write the novel about the apartment building with the spooky past and equally evil present. The Dakota was used for the interior shots in the movie; the building was known in the film as ‘The Bramford’. In the novel, and the film, the building was seen as having had a very gruesome past.